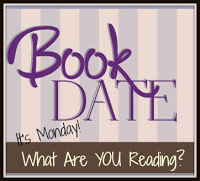 Book By Book: It's Monday 2/26! What Are You Reading? I really like how you include what your entire family is reading! I already blogged what I've been reading, so let's see if I can summarize everyone else. Three people in my family are finishing Ready Player One to prepare for the movie. My 14 y/o daughter keeps telling me how much she loved recently reading Love & Gelato and my 12 y/o son is juggling one of the last Series of Unfortunate Events books along with Timmy Failure, Hunger Games, a Star Wars novel, and he's starting the exciting Alex Rider series. That kid reads like my husband, rotating books throughout the week by reading just a couple chapters at a time out of each. I struggle with that type of reading. Hubby is re-reading Frankenstein, A Wrinkle in Time, and a bunch of other nonfiction books for work/teaching (he's a professor in the English Dept with a never ending TBR pile). Then, of course, lots and lots of picture books for our younger kids. One of their favorites this week is One Day, The End. I'll blog about that one next week. Have an excellent reading week, Sue! My family LOVED Ready Player One when it first came out! I got it from the library, and my husband, older son, and I passed it around - we are SO excited for the movie! I'm with you - just one book at a time (and one on audio while I;m doing other stuff). I could never keep track of a bunch at once...and would probably never finish one! Great that your whole family are readers. My younger son claims to hate reading, though he found a few series he enjoyed as a kid. He's in college now & didn't even read a novel that was assigned in class last year! Maybe some day, he'll come back to it. BTW, I so miss those days of reading aloud to our sons - enjoy! I am not finding enough time to read for fun right now. Somehow I have 4 books going that are work related, which feels a bit overwhelming to me. My free read book is really good though: American Street. I was so excited to see you'd started American Street! Glad you're enjoying it - hope you get more fun reading time soon! Killers of the Flower Moon Is on my to read list, although I'm not sure I will ever have the courage to read it. I read The Dam Keeper but it didn't really work for me. In part this was because it was so dark and I wasn't exactly sure what was going on. It made more sense after I went and watched the movie though. I am definitely planning to check out the video - the book was long but barely got into the story because it was so picture-heavy - a beautiful book, though. Good to hear the new Kline book is proving a worthwhile listen. All the best for the neck and the back, the massage effects may take a day or two to swing in, hope so anyway. Thanks, Kathryn - you are right - doing better today! It was REALLY good, Ricki - informative, suspenseful, and moving. I put A Piece of the World on my Goodreads to find list - it fits our upcoming reading theme during the last quarter of the year (as we talk about art), quite perfectly, I think. Plus, I also have Orphan Train which I am looking forward to reading. Perfect! It's made me more interested in all of the Wyatt's artwork - we live where they lived, so it is a huge part of the culture here, but I never paid much attention before. There's an Andrew Wyeth exhibit starting this month at our local art museum, and I;m looking forward to seeing it!